Last Thursday we digitally serviced you with three new tracks from the forthcoming Here Lies Love release, featuring vocals from Santigold, Sharon Jones, and Steve Earle. This week we are going for adds on the sampler. Email back if you’d like us to resend you the link to download the music. 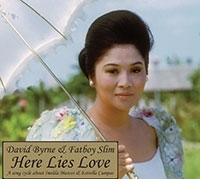 David Byrne & Fatboy Slim have collaborated on a 22-track song cycle about the life of former First Lady of the Philippines Imelda Marcos and her childhood servant, Estrella Cumpas. The full length album will be released by Todomundo/Nonesuch on April 6th. The Public Theater in New York City is developing a theatrical version of Here Lies Love for a future production.